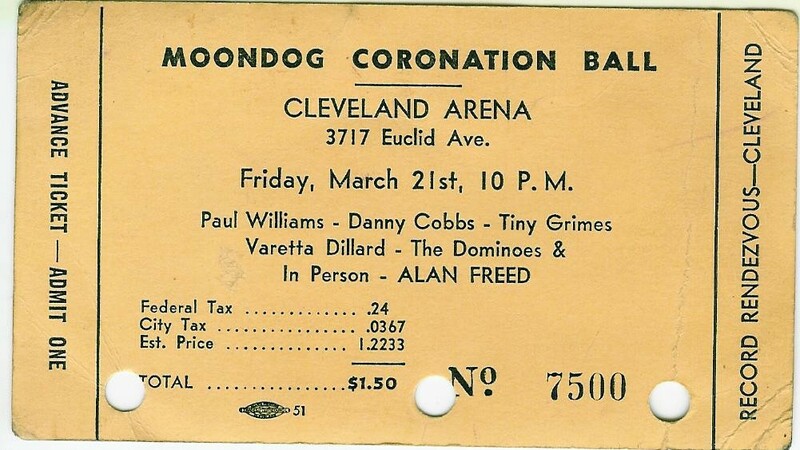 I’ll never forget the look on Terry Stewart’s face when I told him that my family had a ticket from the Moondog Coronation Ball, which took place in Cleveland on this day 64 years ago. Stewart was seated at his desk in the Rock and Roll Hall of Fame, surrounded by some of his personal rock memorabilia amassed over time. There was the full-length jumpsuit signed by both Elton John and Bernie Taupin. There was a lock of Elvis' hair mounted alongside a letter of authenticity. And there was the very microphone that famous deejay Alan Freed used while on the air. 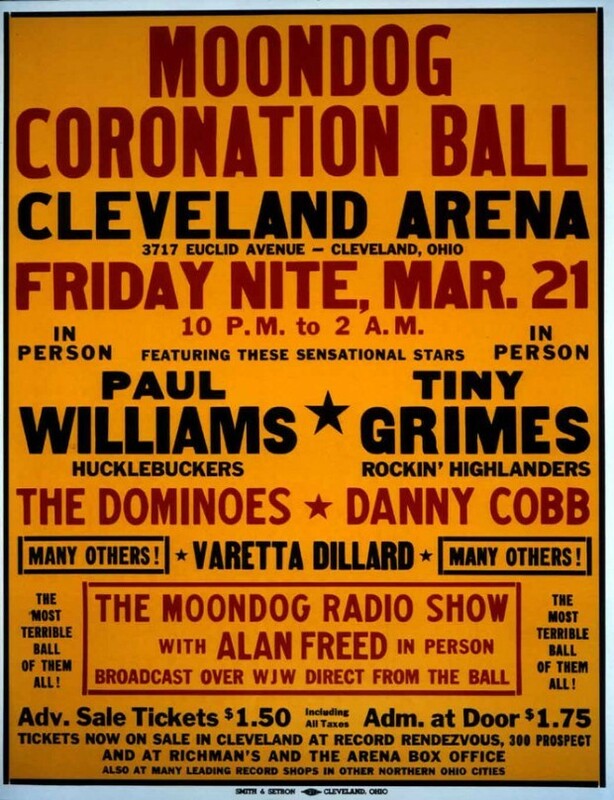 But what neither he nor the Rock Hall had in their collections was a ticket from the Moondog Coronation Ball, which is widely regarded as the first rock concert. None were known to exist, Stewart said, while pointing to a reproduction of the ticket on his wall that I hadn’t noticed. We have one, I told him, a near-perfect document preserved behind glass for decades. Leo Mintz, founder of Record Rendezvous, on the right. My grandfather is Leo Mintz, who in 1939 opened the first Record Rendezvous on Prospect Avenue. By the late ‘40s, that legendary record shop was doing a brisk business in rhythm and blues records – “race records” – but Mintz wanted the music to have a broader appeal, especially in the white communities. He enlisted the help of Akron deejay Alan Freed, buying him airtime on Cleveland’s WJW and supplying all the records (and most of the scotch). "The King of the Moondoggers" went live in 1951, and just months later he and Mintz organized the infamous Moondog Coronation Ball, which not only was the first rock concert but also the first rock concert riot due to a ticket printing error that doubled the number of attendees. The original 7,500 tickets to the concert at the Cleveland Arena sold out ligtening fast. My Uncle Milty decided to organize a second night, and he printed up a second batch of tickets. Unfortunately, the second batch of tickets had the same date as the first, so 15,000 ticket-holders, plus walkups, showed up to an arena that couldn’t accommodate them. Those tickets were printed and sold at Record Rendezvous in 1952, and one of them - the very last of the original batch - was safely stowed away for posterity. It’s a magical piece of Cleveland history that now resides behind glass at the Rock Hall. Our family donated it to the museum a few years ago so that it can be enjoyed by all rock fans who visit Cleveland. The gesture also was an attempt to shine a brighter light on Leo Mintz, who despite helping coin the phrase “rock and roll” has always been outshined by Alan Freed in the history books. In 2010, the Rock Hall dedicated the Leo M. Mintz Gallery, honoring the man many credit with not only coining the phrase, but also paving the way for the Rock Hall’s future place in Cleveland.